What comprises the soul of a chef? What elevates the every day cook into an amazing chef? Is it technical prowess? Creativity? Passion? Stubbornness? A combination of any or all of these? What drives a person to seek perfection in plate after plate and how do they maintain that focus and drive? These are the questions Michael Ruhlman seeks to answer in his book, Soul of a Chef. 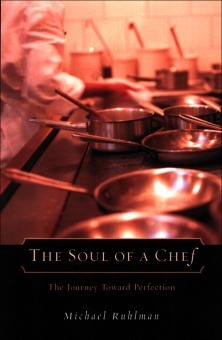 This is the third book in his “Chef” series and maybe the most in depth. In his previous two books,The Making of a Chef and Reach of a Chef , Ruhlman explores the world of professional cooking, starting with enrolling in and observing students at the Culinary Institute of America and eventually speaking with established chefs. But in Soul, Ruhlman attempts to determine what qualities define a great chef and what is the road one must take to achieve greatness. Soul begins with Ruhlman observing 10 chefs who are partaking in the Certified Master Chef’s (CMC) exam. This is a gruelling, week-long exam that tests the chefs’ technical abilities. It focuses on technique and execution and is so difficult that the pass rate is well below 50%. Ruhlman documents the rapidly changing mental health of the chefs as well as their motives for taking the test in the first place. Some do it for a bump in pay; some for the challenge; some for the pedigree apparently associated with it. It is a controversial test in the food world, however, as it is taken by so few – and passed by even fewer – that its relevance is questionable. It assumes that the only measure of a chef is a technical one, but is that the only factor? Is it even the most important one? The middle of the book is spent with a now-famous chef, Michael Symon. Symon has just opened Lola, helping to give Cleveland some foodie credibility. Symon is a gregarious, affable guy who clearly loves to cook and runs a loud, chaotically-organized kitchen. The appearance of his food may not be 5-star, but no matter: the flavours are outstanding. Ruhlman explores the idea of perfection in taste and experience being more important than exacting technical standards being met. Finally, the last third of the book follows Ruhlman as he travels across the country to the Napa Valley where Thomas Keller is blowing minds and making people fall in love with his food at The French Laundry. Keller is not a professionally trained chef, but he produces some of the most technically accomplished, striking plates of any chef in the world. He cooks from the heart and his technical skill is almost unparalleled. Ruhlman examines all three aspects of success in cooking (skill, heart and a combination thereof) and it leads him to conclude that there is no one thing that constitutes a great chef. To be truly great requires myriad factors working in harmony. I’m a big fan of Ruhlman’s books as he delivers an honest, in-depth look at the culinary world without getting too lost in the details and without being sycophantic. I’d highly recommend picking up any of his books for a fun, interesting read!